This premier 2004 Cawood built free standing site condo in The Greens is the epitome of quality & style. Nothing was spared to create over 5,000 sq. ft. of living space on 3 levels. Picturesque views from both the main level screened porch & the walk-out patio of a private pond & woods. This very private site condominium community is well maintained with winding streets, lush green space, beautifully kept homes. Location is ideal. Minutes to Eastwood Town Center, I-69 interchange, Meijers, downtown E. Lansing & MSU. Award-winning E. Lansing schools. New Donley Elementary is under construction and will be open fall of 2019. 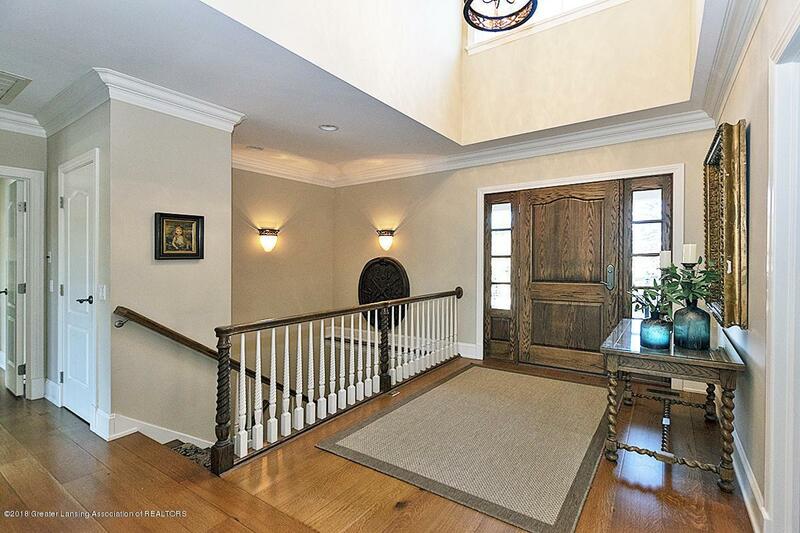 Step into the spacious 2 story foyer with 3/8'' wide plank hardwood flooring that flows throughout most of the main level.This wonderful open floor plan allows for a more casual living style that most buyers are looking for. Stunning great room with beamed cathedral ceiling, full wall of windows overlooking the pond & woods. 1 of 3 fireplaces is surrounded by built-in book shelves, incredibly beautiful moldings and woodwork. Each living space is defined by the arched-pillared openings that enrich & add to the overall quality of this property. The island kitchen has a blend of white & maple cabinetry, quartz counters & top quality appliances. Butler's pantry with granite counter- prep sink & walk-in pantry make this kitchen a winner! The adjacent dining area has a slider to the 390 s.f. wrap around screened porch. Large enough for the whole family! Glass French doors open into the study. Rich wood bookshelves, lattice beamed ceiling, gas fireplace & wood flooring. Slider to deck. Old world charm! The main floor master suite is like no other. Same arched/beamed cathedral ceiling as the great room, views of the pond & loads of natural light. Large master bath with 16" tiled floor, glass & ceramic shower, dual sinks-solid surface counter, heated towel bar, stool room. His/Hers walk-in closets. Private dressing room beyond the master bath is definitely a great hide-away! The 2nd level could be teen-age/in-law/guest quarters. Huge bedroom, private bath & walk-in closet. The walk-out level is a home all by itself! Spacious family room with 3rd fireplace flanked by built-in bookshelves. Large bank of windows looking out on the covered brick patio, yard & pond beyond. Room for a game table, sitting area & of course the Big Screen! *Plumbed for a wet bar on the E. wall behind the wall unit. 3 good sized bedrooms (1 currently used as an office with slider to patio), 2 additional full baths, exercise room, walk-in storage/game closet. 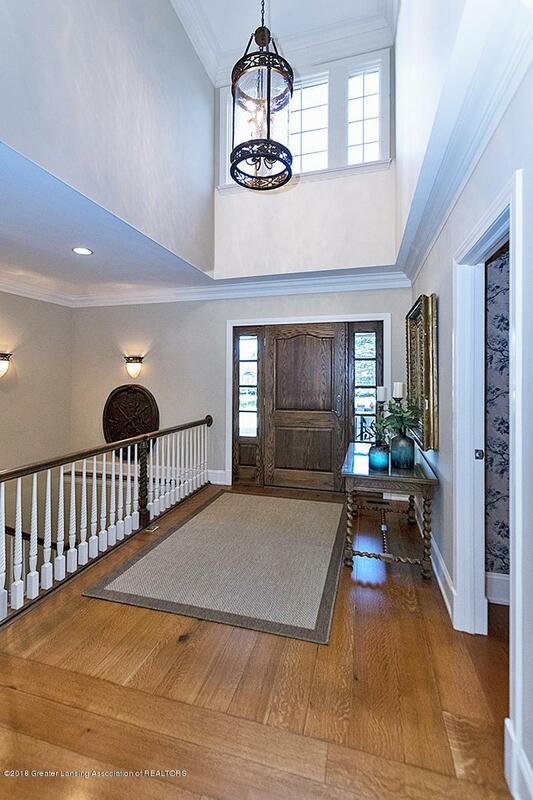 So let's recap....5 bedrooms, 4.5 baths, 1st floor laundry, study, finished walk-out and...ELEVATOR! Yes, don't worry about family or guests who can't do stairs, there's an elevator. A complete list of all the "notable details" are online & at the property. This is a one of a kind "bucket list" home for the buyer who appreciates excellence! Listing provided courtesy of Janet Munn of Berkshire Hathaway Homeservices Tomie Raines.